I just finished reading a pretty interesting book titled, “The Experience Economy” written by Joseph Pine and James Gilmore. In it, they describe how a company, in order to be successful in the market, will have to change from supplying commodities, to go above supplying goods and beyond offering a service to staging an “experience.” Lots of good “how-tos” but the one underlining theme they really are talking about and what I have chanted often in my product marketing and sales career is: you need to Differentiate or Die. 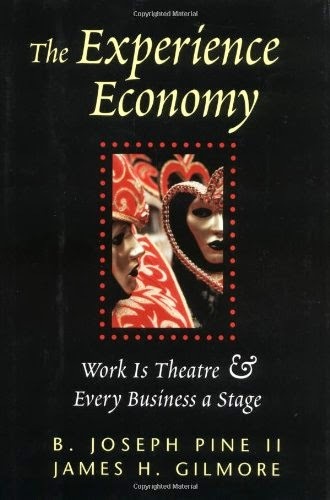 Part of parcel of this differentiation comes from that belief that business is theater, and in order to keep customers, you need to keep them entertained. In Business School, when you are forced to take statistics, the focus is on the Central Mean Theorem, or finding the average of a large population. This unfortunately has been transferred into the marketing strategies of most large and mid-sized companies. As a “safe” strategy, this might seem like a good idea, but I can list countless American retail institutions (Ames, Bradlees, Service Merchandise) that followed a “me-too” approach, and eventually lost that cache that made them successful to begin with. One of the very good concepts of this books was something called “mass customization.” This concept is essentially how you can make each customer feel like you are offering a service just for him or her. Talk about a differentiated service? Anyway, just remember, if your product or service is not differentiated, it is just white noise. This is exactly the focus of the new Bootstrap Experience Subgroup: http://budurl.com/328r - and a dialogue around Austin as an "Experience City" is also gathering momentum. Thank you Bijoy for the comment! I like the fact that Austin's BIG differentiators are in its EXPERIENCE!